November’s featured artists are Mary Lou Boydston with finely crafted jewelry and Dennis Johanson with his earthenware and porcelain. Join Mary Lou, Dennis, and other Gallery Calapooia artists for the First Friday reception on November 4 from 6 – 8 pm. This entry was posted in and tagged Dennis Johansen, exhibit, Gallery Calapooia, Mary Lou Boydston, Reception on November 4, 2016 by Rob Robinson. 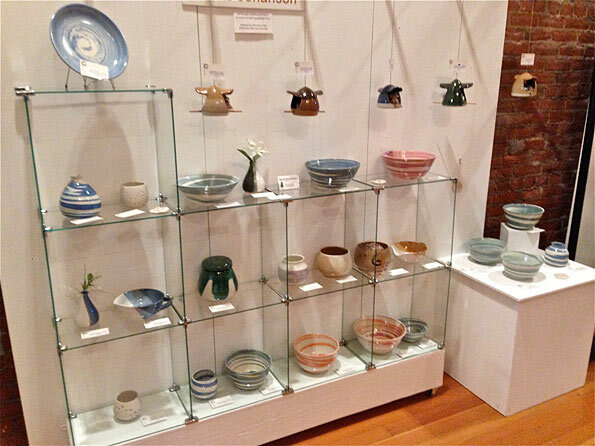 November’s featured artists are Mary Lou Boydston with finely crafted jewelry and Dennis Johanson with his attractive variety of earthenware and porcelain pottery. Join Mary Lou, Dennis, and other Gallery Calapooia artists for the First Friday reception on November 4 from 6:00 – 8:00 pm. This entry was posted in Event, Exhibit, Gallery, Reception and tagged Dennis Johansen, Gallery Calapooia, Mary Lou Boydston, Reception on October 31, 2016 by Rob Robinson. This entry was posted in Reception and tagged Gallery Calapooia, Mary Lou Boydston, Pat Spark, Reception on October 8, 2015 by Rob Robinson. Both Mary Lou Boydston and Pat Spark love nature and use nature in its many forms as the creative force for their art work. In this exhibit, “Perfectly Natural”, the two artists are working with nature in some very specific ways. Mary Lou Boydston is a metalsmith. 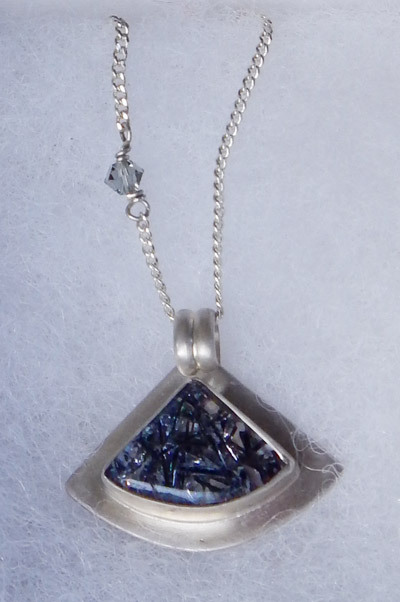 For her, the process of making jewelry begins with the stone. 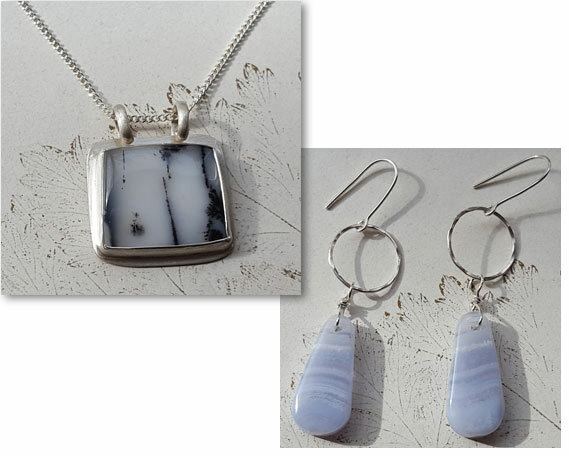 She loves working with Oregon stones such as Polka Dot Agate and Owyhee Jasper. 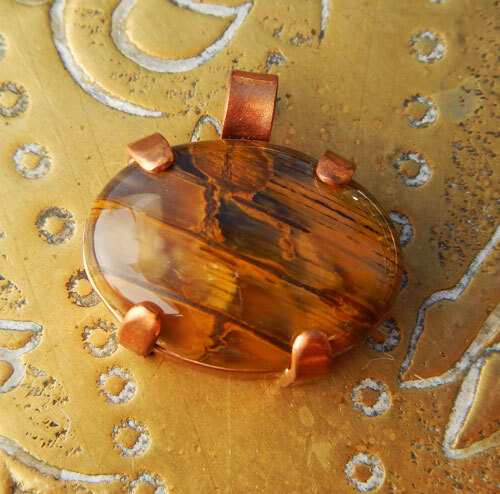 She gets her inspiration from the stone itself, using them to help her to decide which metal is best suited for color and texture. Then she works this metal in various ways to bring the stone to a pleasing and useful design. She has lived in Oregon for much of her life and she feels the Willamette Valley is a special place to create her art. She draws on her love of this place and the rocks she finds here as her inspiration. Pat Spark is working with a softer form of nature. 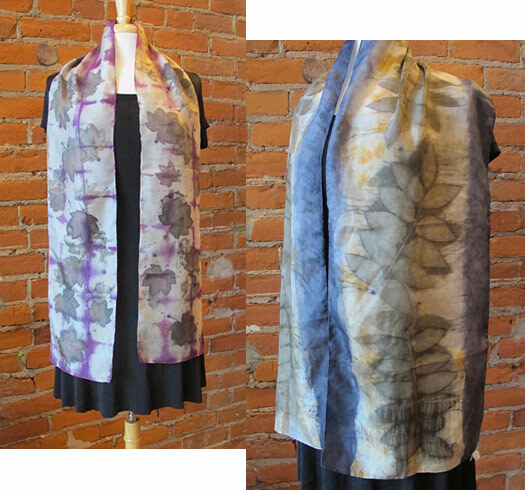 This is using pigments from nature to create color on her textiles. In this exhibit, she is using two natural pigment dyeing techniques. One is using leaves from nature to do contact printing onto cloth. With pressure, steam and time, the pigments from leaves are transferred to the cloth, leaving their impression behind. Spark gathers these leaves on trips around the Willamette Valley- the birch leaves from her doctor’s parking lot, the smoke bush leaves from a fellow artist’s yard, etc. Not all leaves will give pigment, so it is a game to be played with nature- What will these leaves do? What about those? Ms. Spark also uses pigments obtained from the plants by cooking them in water, creating a dye. While most of these dyes are made with local plants, some such as indigo and eucalyptus, are ancient dyes grown in other parts of the world. Boydston and Spark are excited to show you their new creative work and hope to see you at their reception at the gallery on Oct. 9 between 6:00 and 8:00. 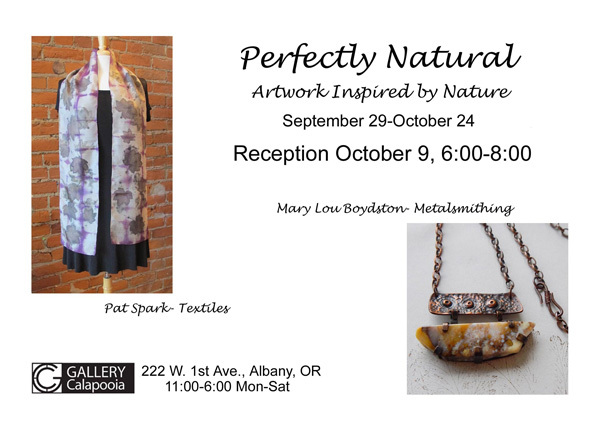 This entry was posted in Gallery, Reception and tagged Gallery Calapooia, Mary Lou Boydston, Pat Spark, Reception on October 1, 2015 by Rob Robinson. Come meet new Gallery Calapooia artists, Marilyn Lindsley and Mary Lou Boydston and join guest sculptor, Kathi Borrego, featured gallery artist, Linda Herd and other Gallery Calapooia artists for a reception on Friday, July 3 from 6:00 – 8:00 pm. Complimentary appetizers, wine and non-alcoholic drinks will be served. Lots of new artwork to see and new artists to meet! This entry was posted in and tagged Kathi Borego, Linda Herd, Marilyn Lindsley, Mary Lou Boydston, Reception on July 3, 2015 by Rob Robinson. Two New Artists at Gallery Calapooia! We now have two new member artists at the gallery, Marilyn Lindsley and Mary Lou Boydston. 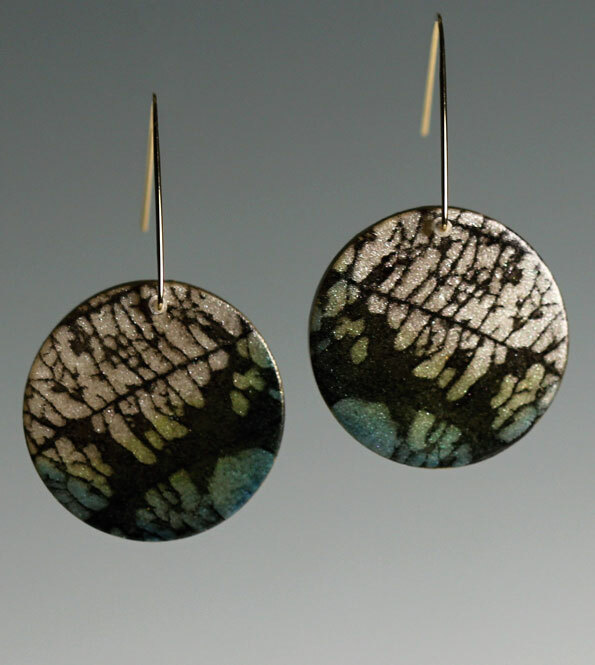 Both artists create beautiful jewelry, but in very different styles and using different materials. Come to the reception on Friday, July 3, 6 – 8 pm to meet Marilyn and Mary Lou and see their work. Find the perfect creative necklace or pair of earrings – or both! This entry was posted in Event, Gallery, Reception and tagged Gallery Calapooia, jewelry, Marilyn Lindsley, Mary Lou Boydston on June 29, 2015 by Rob Robinson.